Almost three years ago, I had a pivotal experience in my hiking life. The Angeles National Forest, my main hiking stomping grounds, were on fire. Even though I was a daredevil, I wasn’t one to…hike in fire… so I ventured outside of my comfort zone. 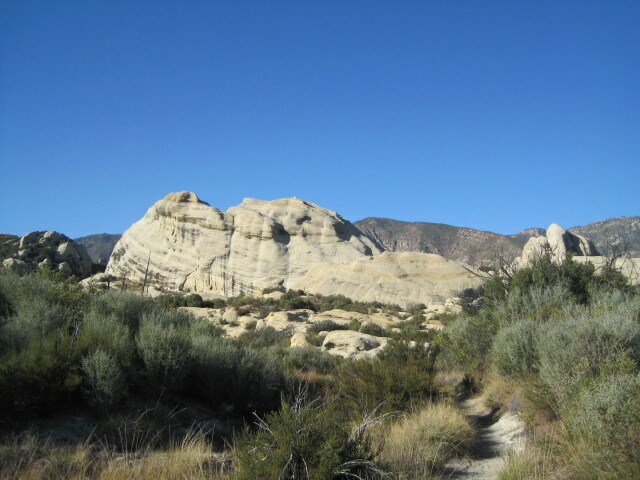 I began to hike in the Ojai area, specifically in the Piedra Blanca area. Piedra Blanca is a cool area I’ve spoken of multiple times here and is an overall fun spot to hike. The hike to the big, white rock is rather benign, in fact. 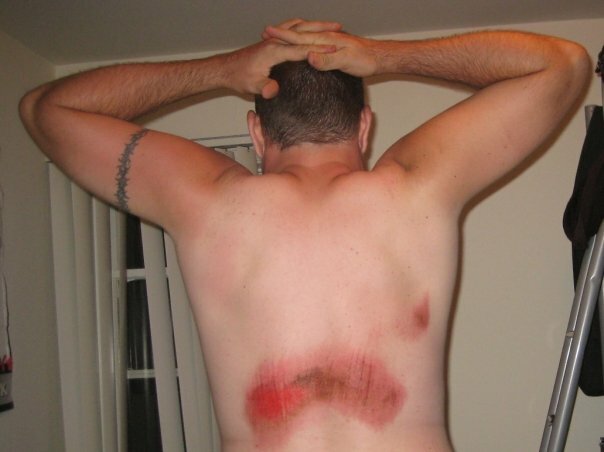 However, on this hot day in September of 2009, something went wrong. I drove into the parking area (to hike by myself) and noticed only one other car. I trotted over ot the sandstone of Piedra Blanca and began to scramble around, jumping and running on the rock. I progressed further back than previously and scrambled up, up, and up. I got to a place where I was maybe 30-40 feet high atop one of the mini-pinnacles. However, when I went to descend my path, I found the sandstone very slick and dangerous…so I climbed back up and tried to find another way down. I commited to a slightly less steep way on the backside (not facing parking lot) of the rock and ended up stranded halfway down on a small ledge. I was unable to climb back up to the top and the drop down was extremely steep. This is where things changed for me forever. I was crouched on this tiny ridge for 10 minutes. 15 minutes. 20 minutes. Physically, my body started to shake. I got “Elvis leg.” My stomach was in knots and I could feel my heart racing. My perspective was becoming dizzier and dizzer. Oh yeah, and vultures were beginning to circle me. Literally. Like in the movies. They actually do that. In response, I focused on my mental being; I did everything I could to remain calm. “Ok,” I thought, “I’ll signal for help. (Blew my whistle, no responses…there’s no one here). Ok. Things are bad but its 20-25 feet down. What can I do to get down and minimize my injuries?” I took my shirt off and created a turban to pad the area around my head. I slid my Ipod and water bottle down the hill to see if there were any bumps or protrusions I would want to know about before sending my body down. It seemed a bit bumpy but not too bad, not just kind of steep. After perhaps 30 minutes, my legs were really shaking, and I could hardly kneel any longer. I decided to crab walk down as far as I could and I was prepared to slide when I could crab walk no longer. I prayed as I began my careful descent. However, after perhaps 3, 4, 5 feet, I lost my grip and whoosh I went down the hill on my back. Next thing I knew, I was waking up on the ground. Back was bleeding, knees were bleeding, head hurt, I felt really dizzy. But I was alive! And nothing was broken, nothing was in need of stitches. I was very lucky. I ran back to my car and drove to CVS to take care of my wounds. Here’s the thing: this experience was the first time I can remember ever getting that dizzy, woozy, and stomach-in-knots sensation. Over the next couple years, I would feel it again on steep hikes. It’s increased in frequency with time even though I haven’t done anything as death-defying or even as steep since Piedra Blanca. I’ve felt it on Muir Peak, Iron Mountain, Mount Baldy, and Mt. Williamson in the Angeles National Forest. I’ve felt it on Inspiration Point in Malibu. And this week, I felt it for the first time on a fire road. I was hiking the Romero Catwalk Trail, a very steep but fun and doable hike in Montecito. It’s a slick-ish road, similar to a fire break, but never has sections for more than 100-200 feet of steep drop. For whatever reason, I decided to leave my trekking poles in the car. My goal was to get 2 miles in before work. I hiked up Romero Trail, then took a left to branch off onto the catwalk. Up hill #1, no problem. Up hill #2, no problem. But then I looked back. BAM. It hit me. Dizzyness. Nausea. Knots in the stomach. Heart racing. Dangit. 2. I evaluated my way down. Straight would be toughest. Instead I zig-zagged and side stepped. On the side of the road was a 1 foot high dirt pile that followed the edge of the road down to the plateaued portion. I kicked stepped on this part, pretending it was snow and I was post holing. 3. I drank water. It wasn’t long into my hike at all and I knew I was hydrated and had plenty of electrolytes. But I drank. It distracted me in a good way. After a few minutes, by some godsend, a pick up truck randomly started driving up the road. A red one. With a fire department logo on it’s door. As they got closer, the window rolled down. “You ok?” the two firemen asked me. “Um, I will be… but… I think I’m having an episode of some sort…” I replied. “Ok, get in, we’ll drive you down.” And they did. My purpose in writing this isn’t to focus so much on these two incidents but instead to focus on what to do when the body flips out. 1. Stay cool. When your mind loses control, your body is going to further lose control. Eat something, drink something, get in the shade to literally cool down. 2. Talk. Verbal processing can relieve mental tension. Or talk to your partner. Hiking alone can be dangerous and a partner helps a lot. 4. Strategize. Is there another way down? Can you use your trekking poles or other resources? Or do you need to call for help, whistle, SOS the Spot locater? Kick steps/heal kicks can help create traction. 5. Pray. Some people don’t believe in God. Some do. Whatever. I do and I believe God likes to help us out in messed up situations. So there. and #6 for me will be going to the doctor to diagnose this vertigo/balance disorder thing. I refuse to let it stop me from living my life of adventure… but I have a responsibility to be smart about it and to come back home safely. No hike is worth dying for. Have you experienced anything like this? What have you done to get through vertigo-inspiring situations? Posted on July 5, 2012, in hiking and tagged angeles national forest, balance disorder, inspiration point, iron mountain, los padres, malibu, montecito, mount baldy, mount williamson, muir peak, ojai, piedra blanca, romero canyonv, sandstone peak, stressful situations, trekking poles, vertigo. Bookmark the permalink. 1 Comment. Pretty brutal, bro. Hang in there. I wonder if it’s like post traumatic stress or something from the first incident?